Racquel Writes: Opportunities in the Great Big Literary World- I'm Baaaaccckkkk! Opportunities in the Great Big Literary World- I'm Baaaaccckkkk! Guess who's back?! Sorry all but I had to take a momentary leave of absence. I'm currently working on a few big projects, and I really needed to take a break from blogging, because, well, something had to give. I was also away at my LAST residency this past August! Despite all the drama and the realization that I must write 25,000 words by spring, I am well on my way to graduating with my MFA from Fairleigh Dickinson University next fall. Pray for me. You might be curious about the big projects I'm working on. The first project is my novel. Yes, I've really started it, and yes, I've finally got a concept that I 'm committed to. The beginning (the first 25,000 words to be exact) will be part of my creative thesis. I have the first two chapters so far, though the second chapter needs some work (judging from some of the very constructive comments of my peers at FDU). The second project I'm working on is my literary magazine! That's right, I'm starting a literary magazine with a few good friends of mine. It will be called The Black Fox Literary Magazine. There are just a few more things that need to be smoothed over. As soon as they are, there will be more information. So, that's my update, now on to the good stuff. Here are some new writing ventures! Good Luck! The literary magazine is offering three prizes of $1000 each to one short story, one poem, and one essay. 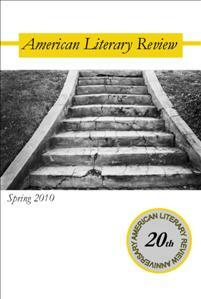 The winners will also be published in the Spring 2011 issue of the American Literary Review. There is a $15 entry fee (which I think includes a subscription, though this isn't very clear). The contest closes on October 1, 2010. See the website for the official rules and details. The Boston Review is offering one prize of $1,500 and publication in the Boston Review's Summer 2011 issue to the best short story. Stories shouldn't be more than 4,000 words and must be previously unpublished. The entry fee is $20 and the contest deadline is October 1, 2010. Entrants will receive a subscription to the Boston Review beginning with the Summer 2011 issue. See the Boston Review's website for official rules and details. The Chariton Review's annual short fiction prize is offered to one short story. The author will receive $1,000 and publication in the Spring issue of the The Chariton Review. Three finalists will also be published in the Spring issue. All entrants will receive a copy of the spring issue. The deadline for the contest is September 30, 2010. See the link below for official contest rules and details. There you have it, now get a move on! Happy Writing! Woo hoo, Racquel is baaaak!!! Thanks for giving us so much info- you rock :) And as Pam mentioned, very excited for this lit mag venture!! !